Either way, as you’re driving, the various shades of green surrounding the landscape will leave you in awe. It’s at that time when I highly recommend to turn off the a/c, and lower your car windows. The breeze will feel warm, but cozy. The perfect early morning mood. As you leave the mountainous area, be sure to check your rearview mirror just to indulge in a picture-perfect scene behind you. The green landscape will turn a little brown, with yellow highlighting the scenery. Mountains turn to plains, and you’ll see plantain and coffee plantations left and right on the highway. At a distance, brown turns to blue as the Caribbean Sea pokes its head at the end, where the sky meets the sea. Nonetheless, the cozy warmth is over. Turn up the a/c and roll up your windows. The southern plains are hot, and by now, it’s almost eight in the morning. The countryside slowly welcomes you into town. The massive letters spanned across the highway serve as an obvious announcement of the city limit. Hard to miss. As locals say: if you didn’t take a picture in one of the letters, did you really go to Ponce? “Ponce es Ponce, y lo demás es parking”, or “Ponce is Ponce and the rest is just parking”, that’s what they say. Ask any ponceño and they’ll proudly say it. Once you reach Plaza Las Delicias, you’ll understand why they’re so boastful of their town. The Spanish colonial buildings give off an elegant vibe, worth noting. Grab a coffee on any of the shops surrounding the town square. Melao Coffee Shop, located inside the Ponce Plaza Hotel & Casino, will bring you back to life after that two-hour drive from San Juan. Puerto Rican coffee at its best. Take it to-go. Head straight to the plaza. Take the morning slow. The best seat at the plaza is next to the lions, a symbol of Ponce. The mist from the fountain will refresh you from the sweltering Ponce heat. The town takes life on its own. The Parque de Bombas will inevitably catch your eye. Painted black and red, Ponce’s first fire station is now a museum and part of the U.S. National Register of Historic Places. Keep an eye out for the quenepas (genip) vendor. If they’re in season, they make a great snack! Something richer than the history of Ponce, is its people. In the Cultural District, next to the town square, you’ll find ponceños eager to tell you all about Ponce. The Rafael Ríos Rey Art Room, in memory of the Puerto Rican muralist, exhibits different collections throughout the year about Ponce and Puerto Rico’s history. The clerk there will gladly tell you all about it. Next to it, Ponce’s History Museum will take you back in time in a retelling of Ponce’s prime years. The exhibits are open to the public every day. Also, Harry Santos’ paintings in Ponce’s Cultural Center Carmen Solá de Pereira portray Puerto Rico’s flora, specifically the ceiba, the city’s iconic tree. He’ll gladly tell you about the gallery nights and the love and effort he dedicates to his canvases. However, art doesn’t limit itself to canvas and galleries in Ponce. As you explore the streets, colorful murals will paint the way. 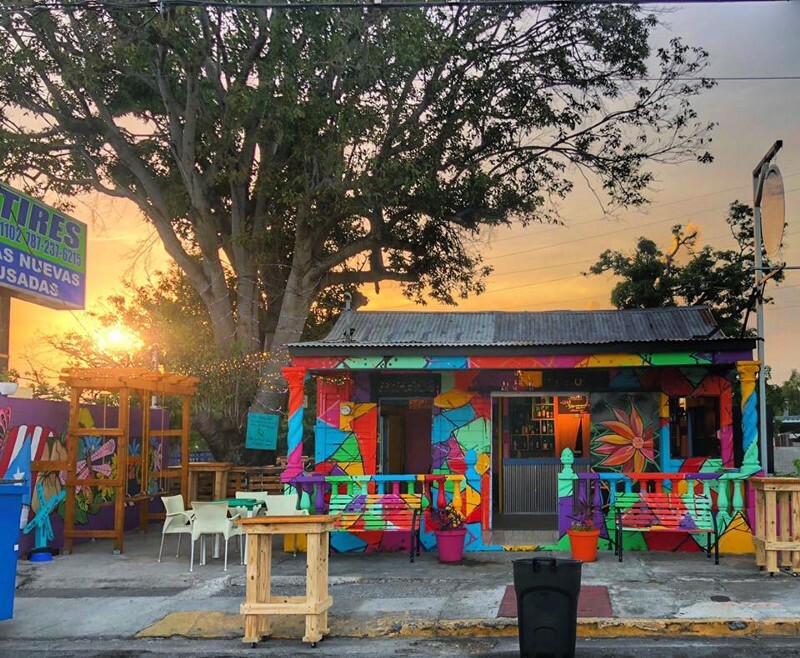 It’s all part of Ponce es ley, or Ponce is law, an effort to revive the town’s abandoned buildings or vandalized walls with Puerto Rican and international artists. Wander through the streets in search of these murals (plus, it makes for a great Instagram pic). In Cristina street, you can find José Vega’s “Waiting for the return of progress in the times of regression”, which is inspired in the beginnings of the Commonwealth and the expectation of change it aroused in Puerto Ricans. By now, you must be hungry. At least, I am. Vacations are a great excuse to indulge in all three meals and the snacks between them. (FYI: Science says we should eat 5 meals a day. Just saying…) While wandering through the cultural district, you might’ve gotten a whiff of pizza. Your stomach wasn’t playing games with you. Campioni, a pizzeria at the corner of Reina Isabel and Salud streets, makes a mean wood-fired pizza. This restaurant gained public notoriety since they opened doors in 2014. It’s a must in Ponce. The Tutti Supremo, with all the works, really hits the spot. (Get a large, trust me.) I’m a fan of a crispy thin crust and they’ve mastered this. Dessert is never out of the question, but let’s take a walk to burn some calories off on the quest for something sugary. King’s Cream is the way to go. This local ice cream shop will please your sweet tooth. They’re made with natural juices, which makes it healthier (right?). Try the coconut flavored one. “De coco, por favor”. Thank me later. Maybe opt for an unusual flavor, like the cake ice cream. Ponce is Puerto Rico’s most populated city outside of San Juan, so imagine how it looks from afar. Better yet, visit Castillo Serrallés to find out. A nine minutes drive from the Plaza will take you uphill to this Spanish Revival style mansion, which was built for the owners of Destilería Serrallés in 1930s. (Don Q, anyone?) Nowadays, it’s a museum dedicated to the sugar cane and rum industries and their importance in the island’s economy. The estate overlooks the city in such an elegant manner, you might wanna get married there (and you can). You can see the entire metropolis and get a glimpse of Caja de Muertos, an islet off the coast (save another day to take a boat ride and visit this beautiful island). Just before sunset, head to La Guancha. Look by the docks and watch the boats leaving the wharf. You’ll catch the sun as it tucks into the horizon. Although part of the boardwalk’s been closed since the hurricane, the kiosks near it make the time worthwhile. (Also, food!) Try some empanadillas de chapín, which are turnovers filled with trunk fish and you can’t pass up this opportunity. Order a conch sandwich… or a conch salad (add some tostoneson the side). The acidity from the lime combined with the crunchiness of the onion and peppers, complements the conch in ways you’d have to experience for yourself. The night’s young and that empanadilla was not enough to hold you off. Craving a fancy dinner? El Negocio de Panchi is the spot for you. It’s a well established restaurant in Coto Laurel, which serves a daily menu with the freshest ingredients. The osso buco never fails to impress. Splurge on the appetizers, though, and always leave room for dessert (did someone say cheese flan?). You can’t leave Ponce without experiencing its nightlife. At 10pm, people are getting ready to hit the streets. First stop, La Tertulia. If you skipped dinner, this bar has all the right bar snacks. The Tertulia Nachos (with carnitas!) are not meant to be shared, because they’re too good. The bar has good music and guarantees a good time, with a more relaxed crowd. However, Hostos Avenue has all the hot spots for college students. The 69 is the new bar everyone’s talking about. What was once a regular residence is now a colorful chinchorro, made with love and dangerously addictive. Plus, the beers are always cold. When you’re ready to call it a night, but are in need of a good late night snack to settle the stomach (vacationing, right!? ), En Las Papas will give you a hug and kiss you goodnight. Next to the plaza, there’s a street cart going at it at two in the morning on a weekend night. Order a fully-loaded potato. No regrets. Ponce is definitely an experience. I know, you’re already on your way. Maybe a day isn’t enough, because there’s so much to see, but the trip’s worth it. Remember: Ponce is Ponce, the rest is just parking.